Our visit to Sengkang Library this afternoon was rather special as we found the signage below. 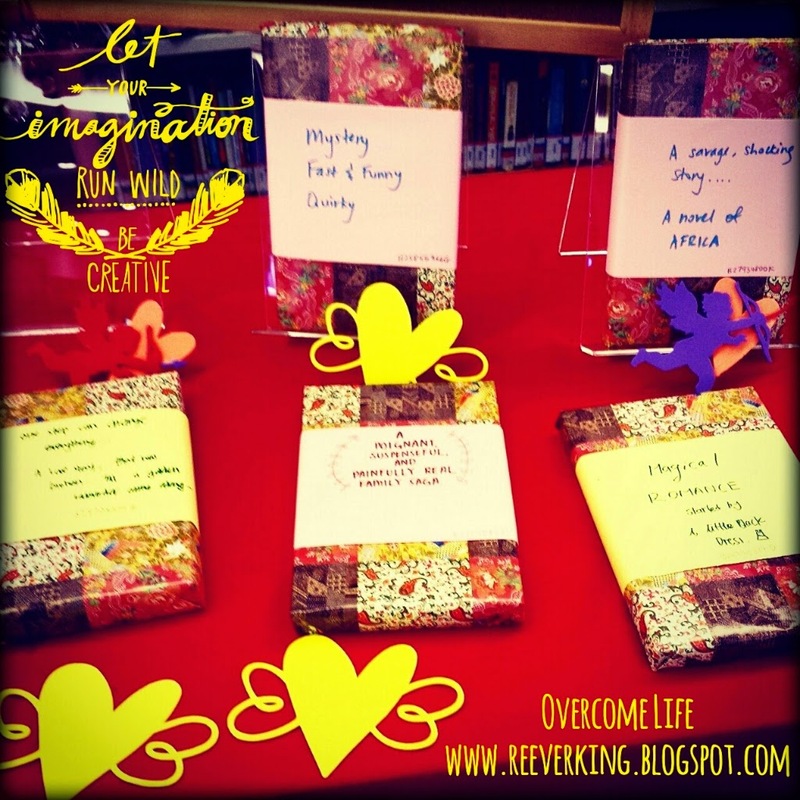 There were books underneath wrapped with a beautiful gift wrapper and there was a hint on top of the wrapper to tell what kind of story the book inside filled with. It could be romance, thriller, horror, mystery, sci-fi, or fantasy. "Feeling adventurous this Valentine's Day? 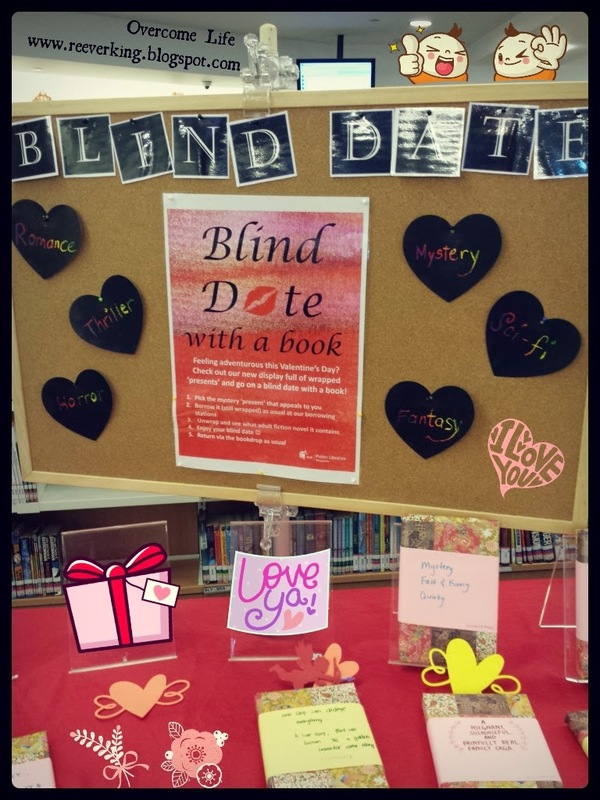 Check out our new display full of wrapped 'presents' and go on a blind date with a new book! 1. Pick the mystery 'present' that appeals to you! 2. Borrow it (still wrapped) as usual at our borrowing stations. 3. 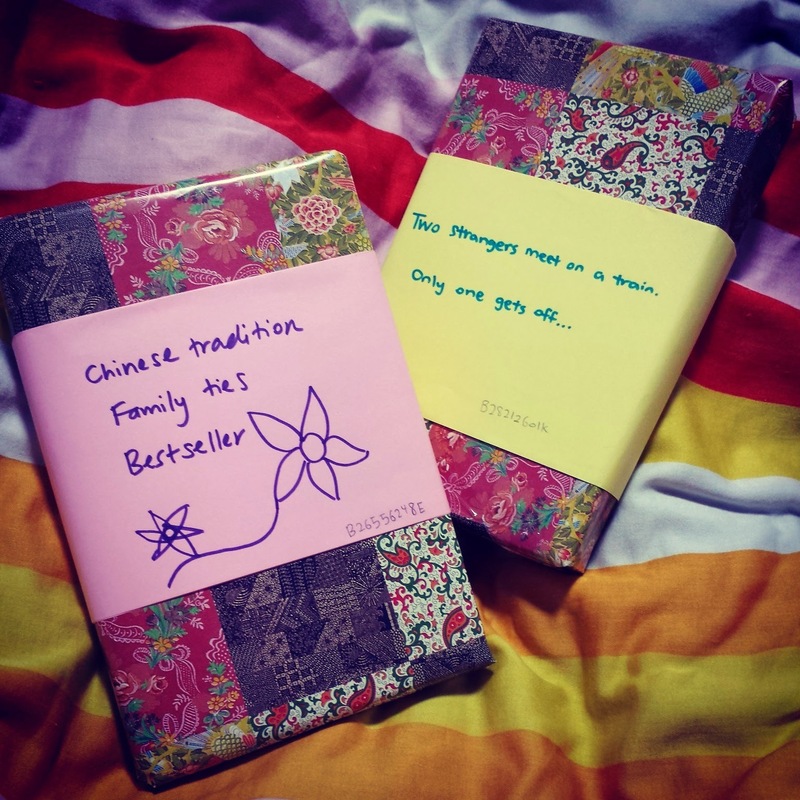 Unwrap and see what adult fiction novel it contains. 5. 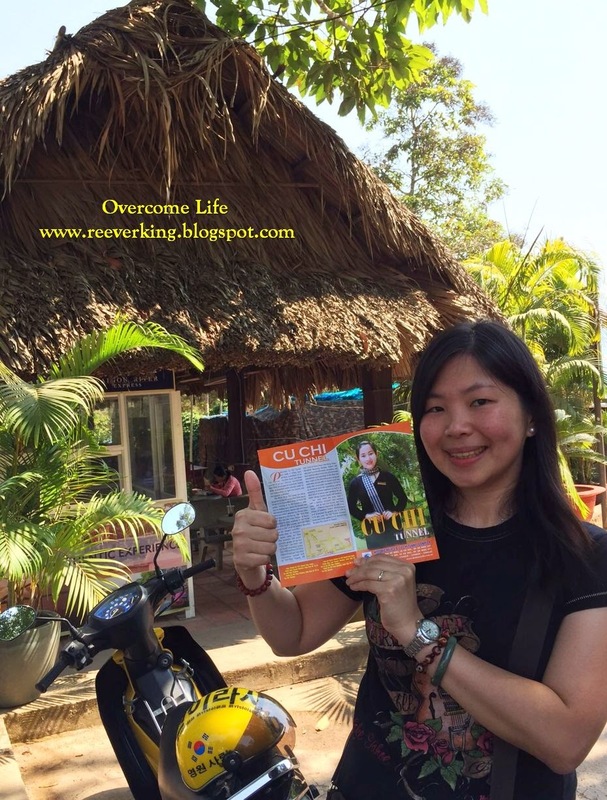 Return via the bookdrop as usual"
On second day we planned to visit the Cu Chi Tunnels by joining the tour and had to depart at 8 am from our hotel. Since our hotel booking wasn’t included breakfast (as our intention to try the local food nearby), we woke up and got ourselves ready a bit early in order to find and eat breakfast before leaving. We looked around at the Café nearby and found all of them were still closed. The Café that I planned to visit earlier was a bit distant from our hotel and there was a construction that blocked our way there. Therefore we decided to look around at nearby area for food street seller. 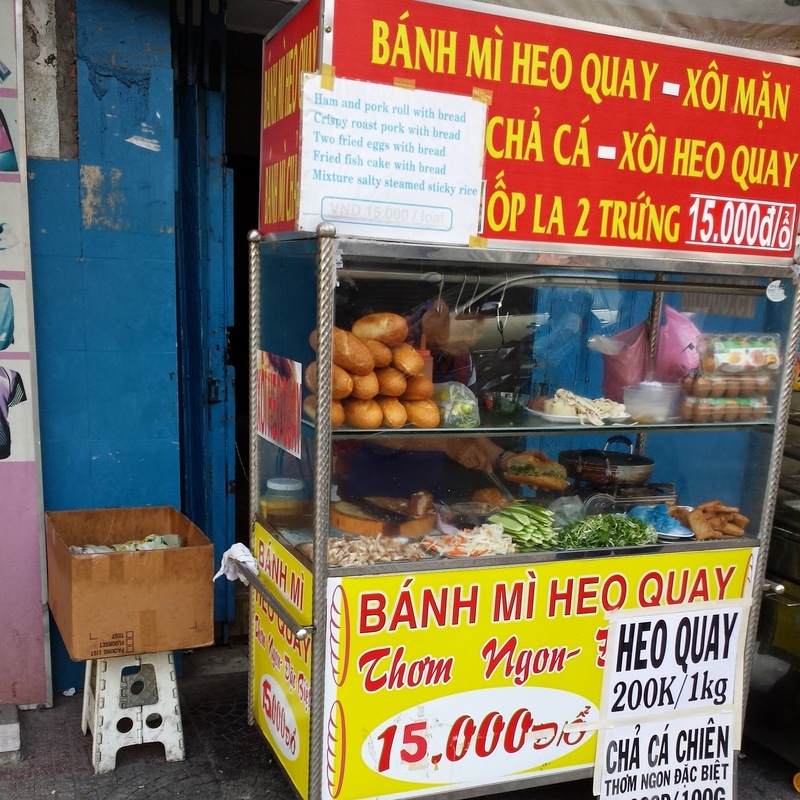 We crossed the road finding any sign of food seller and saw one selling Bánh mì. 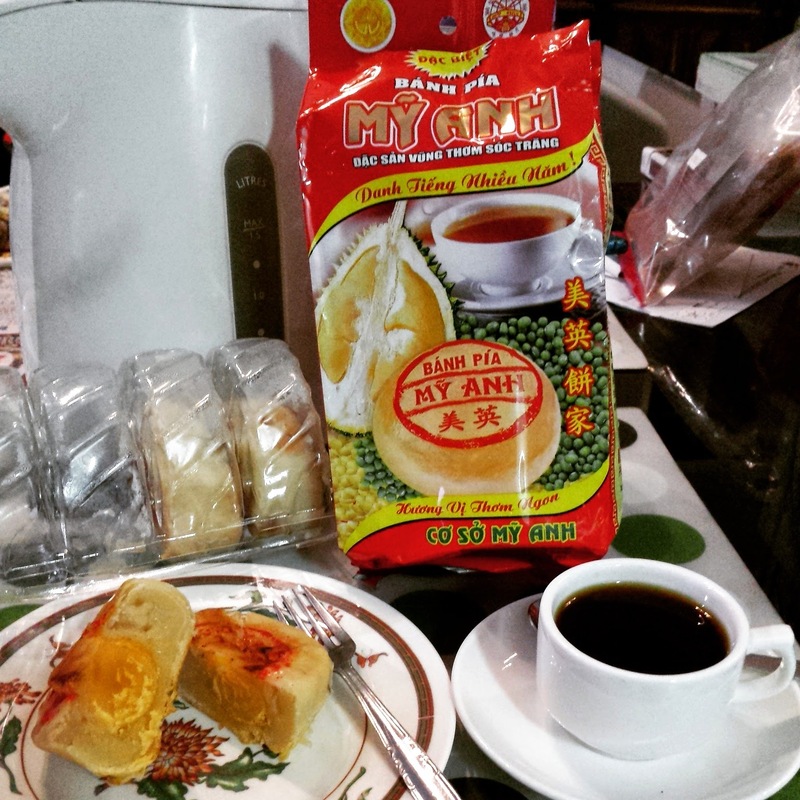 Bánh mì refers to any kind of bread. However, as Vietnam was colonized by French before, the French had long ago introduced their own bread, specifically baguette to Vietnamese. 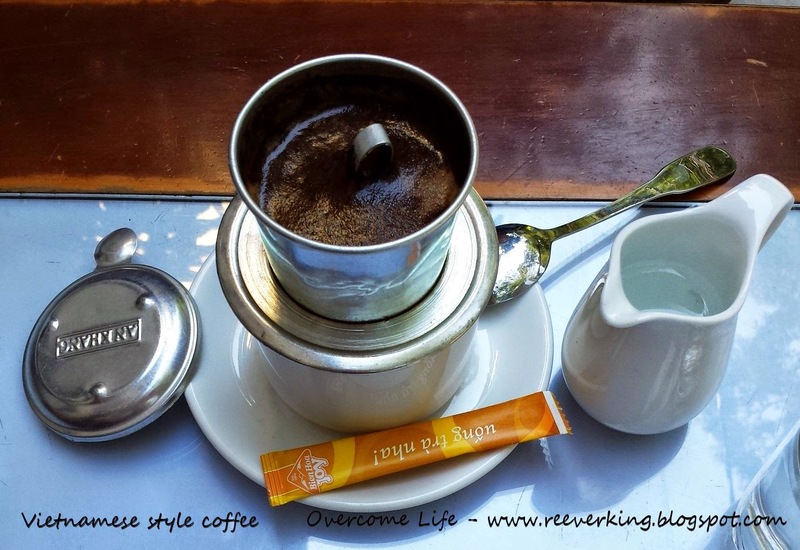 I suddenly remembered my sister-in-law advice before flying to Ho Chi Minh. She asked me to try the baguette there. She said that any kind of baguette there (no matter which stall) was very nice and I should try!!! Hm.. I was wondering if what she said was true. So, we decided to order one first (in case if it wasn’t nice, we could find other food). The seller was very nice. Upon seeing us, he cut few pieces of roasted pork (especially crispy layer part) and handed it in for us to try. My friend, MG, who tasted it first, was immediately shouting to me to order 3 instead of only 1 or 2. She told me excitedly on how nice the baguette was!! Looking at her excitement, I decided to take a bite on her bread and, wow!! It tasted very very very nice!!! The baguette was crispy and not soggy or hard like what we usually bought here in Singapore. The roasted meat was tasty, the accompanying vegetables were fresh, and the sauce tasted delicious!! As per her advice, I ordered two more so that each of us could eat one piece each :) And it was very cheap too!!! 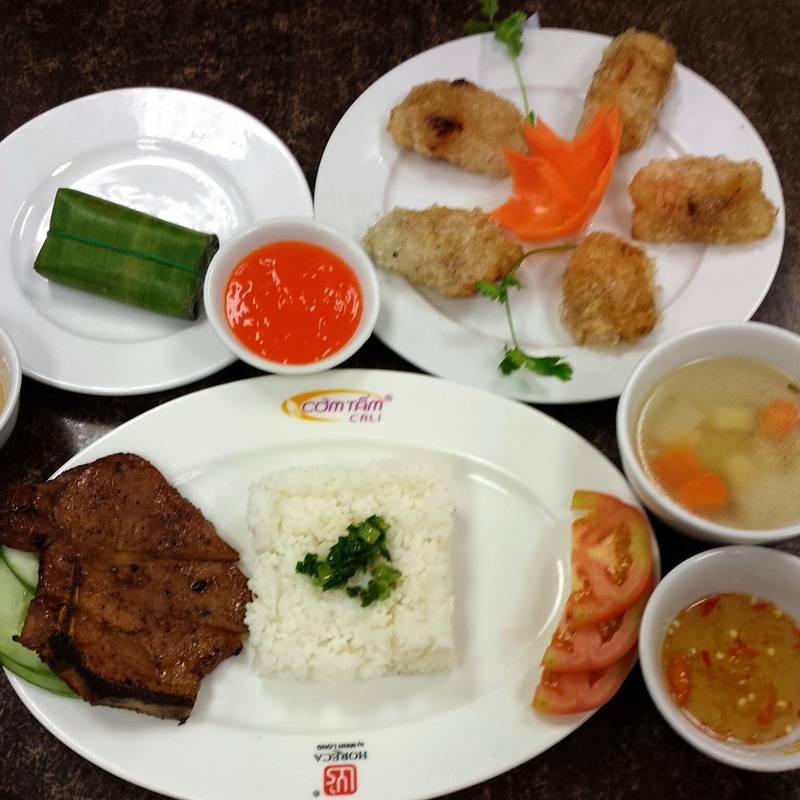 It cost only VND 15,000 each (less than S$1)!!! 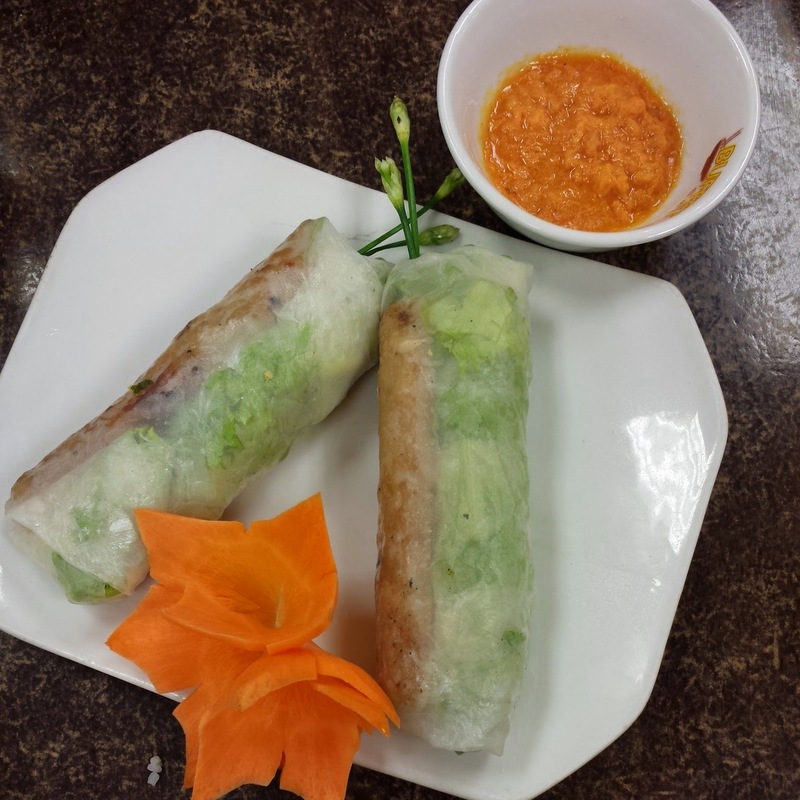 In addition, you could choose few different types of fillings for your Bánh mì. The most common ones were: crispy roasted pork belly, ham and pork roll, two fried eggs, fried fish cake, and so on. So, when you go there, make sure you eat this!!! We munched the bread on the roadside. 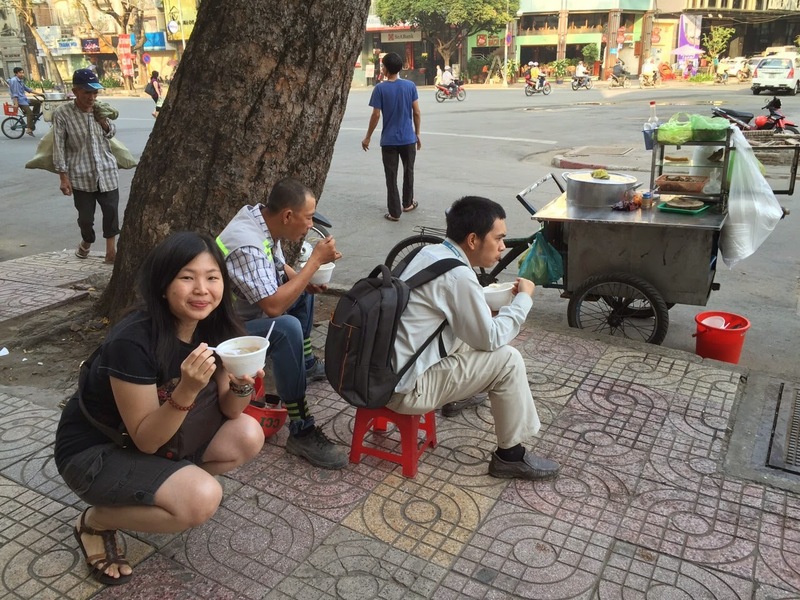 While eating, we saw other sellers selling porridge, Vietnamese style noodle, and something else with soup. 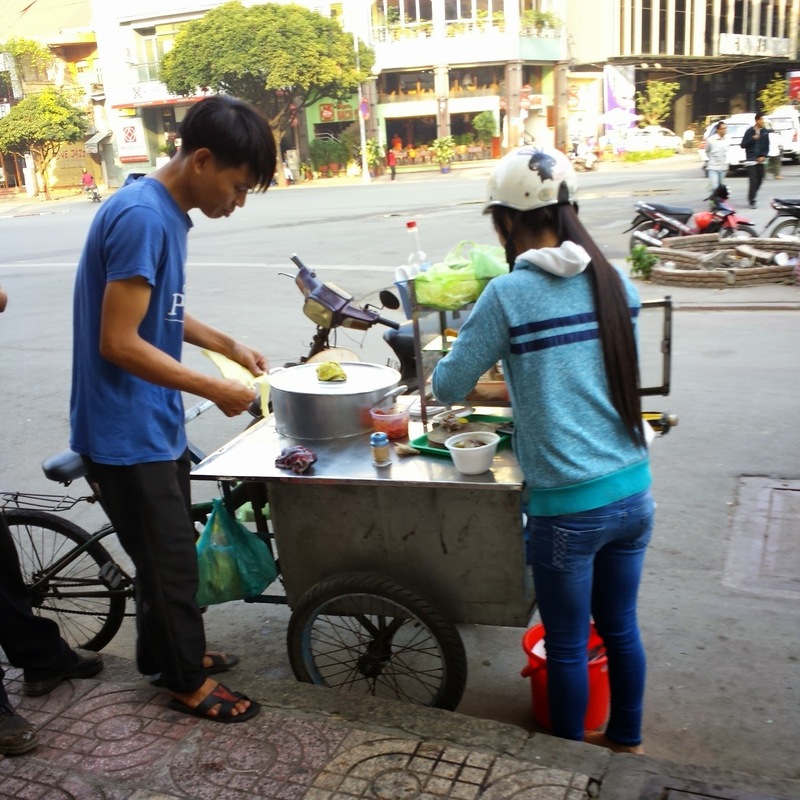 They catered not only to the construction workers or other people who were working nearby the area, but also many people stopped their bikes in front of the carts, bought their food takeaway. The business was not bad. Since we had already had a baguette each, the noodle seemed too heavy for us. Therefore, porridge would be a better choice to try. I asked the porridge seller how much it cost. 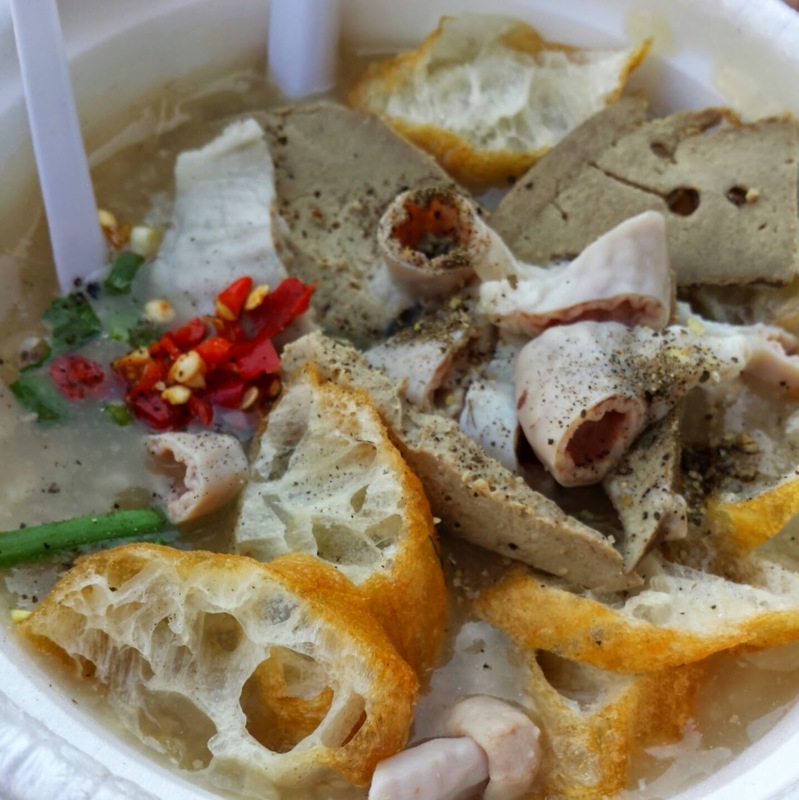 With limited language, the seller said VND 10,000 (S$0.625) per bowl. Wow!!! Without much thinking, we ordered one bowl, again, to try it first. The porridge was not just a plain one. They added some pork parts such as: liver, intestines, and few cuts of you tiao (Chinese fried breadstick) or dầu cháo quẩy (similar what we called here in Singapore, You Char Kway). And the porridge tasted really really good!!! In Singapore, we had to pay S$3 to S$5 for a bowl of pork porridge, depending where you buy. 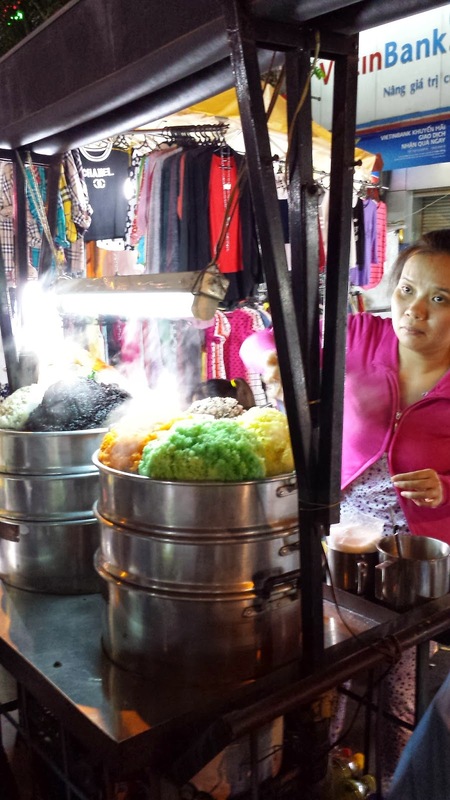 It means 1 bowl of porridge in Singapore, you can buy 5 bowls in Ho Chi Minh! You can imagine how expensive the living standard in Singapore is with this comparison alone!!! By the time we came back to hotel, it was 1 pm. We were all hungry. 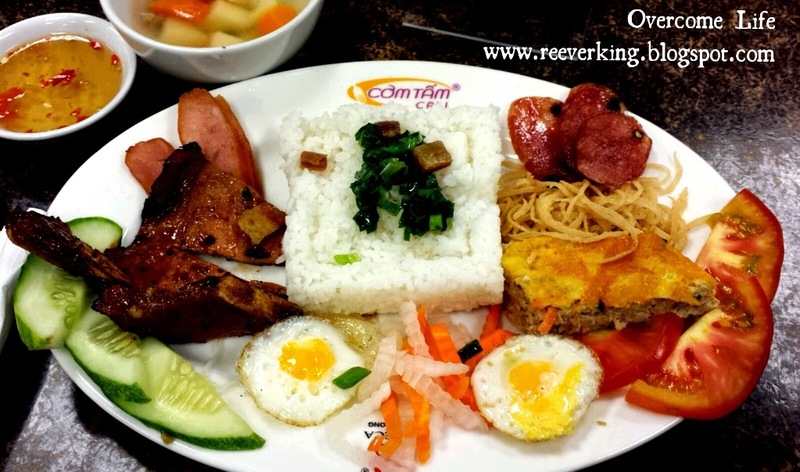 There were plenty of food list that we all had to try and I decided to try the local dish called broken rice (Com Tam) from food chain called Com Tam Cali. The night before my sister-in-law showed us the photo and she too recommended us to eat. We took a cab there. 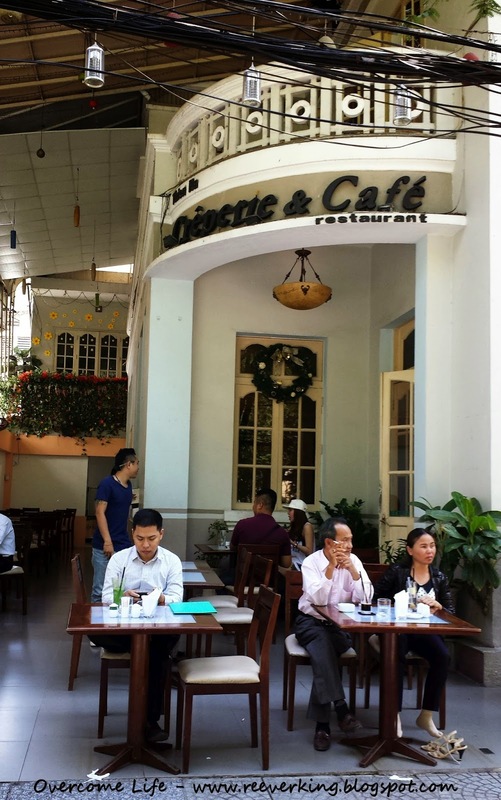 In my list, the address was 35 Le Thanh Ton Street, District 1. The taxi driver dropped us near to a shopping mall called Parkson Saigon. But we couldn’t find any store beside it. I thought I jotted down the wrong address as when I asked around, many of them had no idea where the place was, until a local passer-by helped us asking another person and told us that the food chain might be located inside the mall, at the food court. We followed her advice and walked to the mall and looked for the food court. Hohoho… We relieved when looking at the signage that we were looking inside the food court. But too bad, the choices were rather limited than the usual restaurant’s menu. 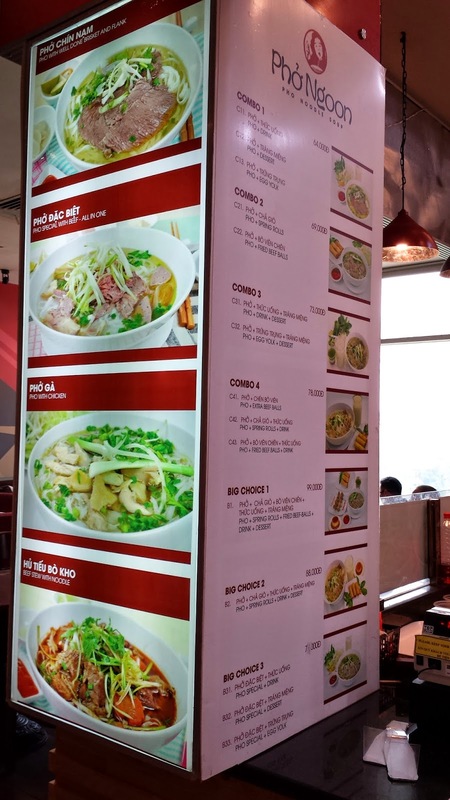 When we ordered their special dish - Cơm Tấm Cali Đặc Biệt 7 Món or Cali special broken rice – 7 flavors (cost VND 65,000/portion), the seller told me that they had only left with 6 flavors. We had no choice but to accept it. 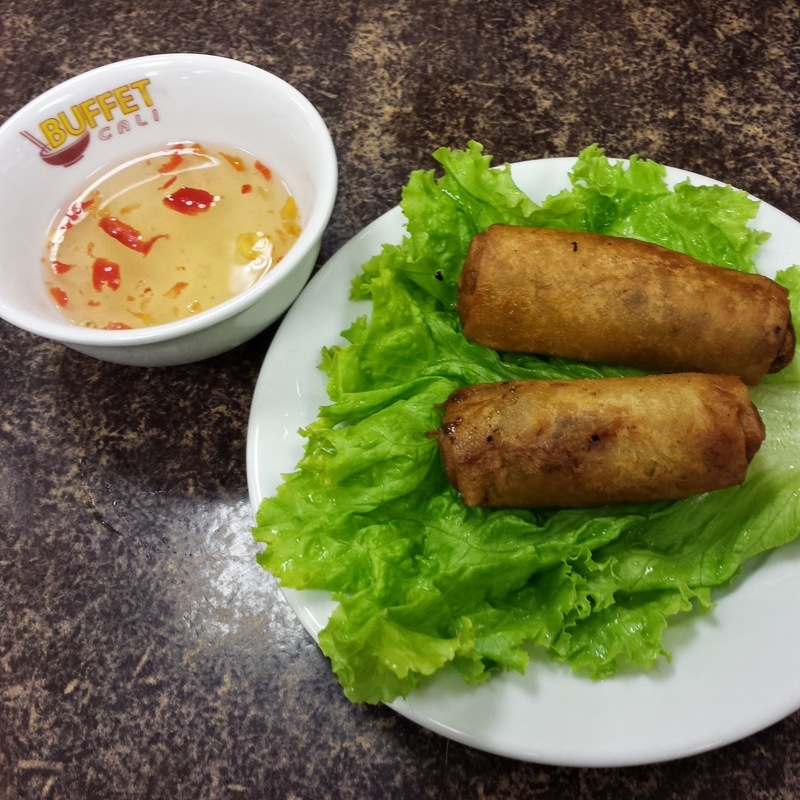 We ordered Sườn Cốt Lết Nướng or house special BBQ pork (cost VND 44,000/portion), Nem nướng cuốn or grilled pork spring rolls (cost VND 32,000/portion), Chả giò or egg rolls (cost VND 18,000/2 rolls), and a local drink for MG. Eih, we were quite surprised to see the portion. The photo that my sister-in-law took was looked like a big portion. But in real, it wasn’t. MG went to the next door stall and ordered some other local dishes that we never tried before. 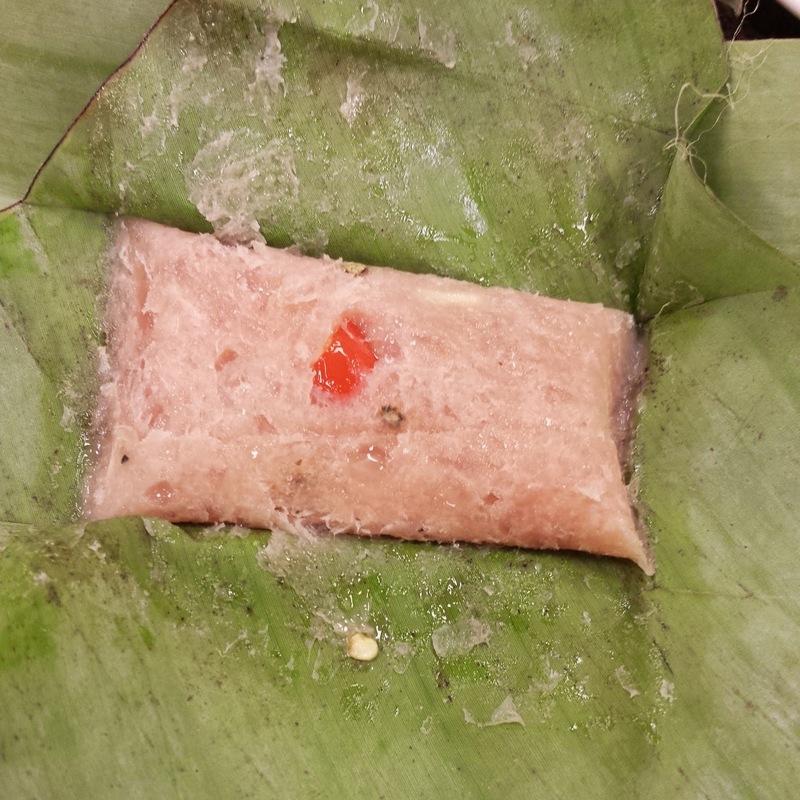 Couldn’t remember the name but it tasted like ‘cireng’ or deep fried rice flour filled with prawn and dipped into a sauce, and a steamed pork paste wrapped with banana leaf, which tasted a bit unusual. I saw Pho shop called Phở Ngoon in the food court and asked my hubby and MG whether their stomachs were still available for some Pho. 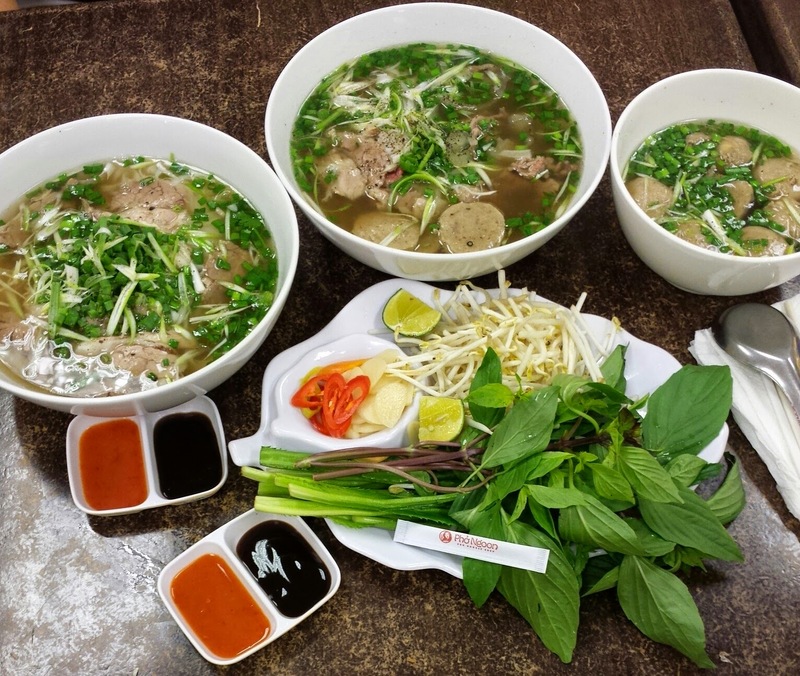 Because Pho was the MUST HAVE food when you visit Vietnam. It’d already been day 2, but we still hadn’t tasted any Pho yet. So, although their stomach had already been half full, they both were agreeing to my suggestion. We went back to the hotel after a heavy lunch. 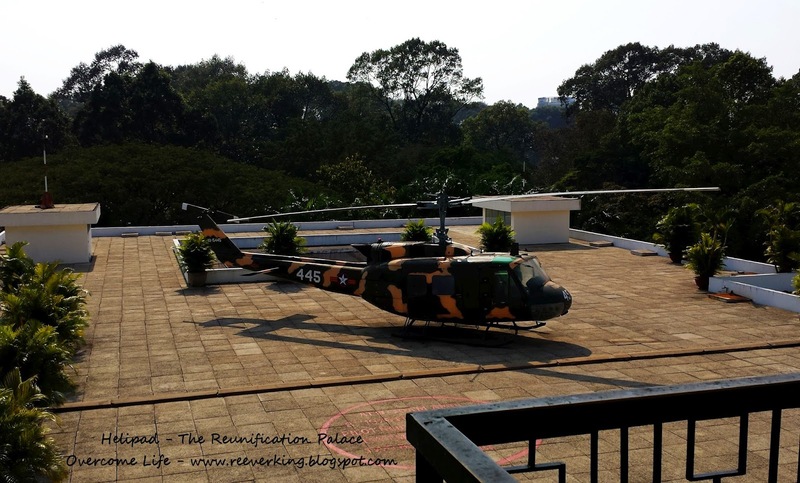 We took a look at the swimming pool at the rooftop. MG asked me to look at the Spa menu. The price was quite ok so we decided to book a traditional Vietnamese spa for the next day. Then we just went back to our room and took a rest. 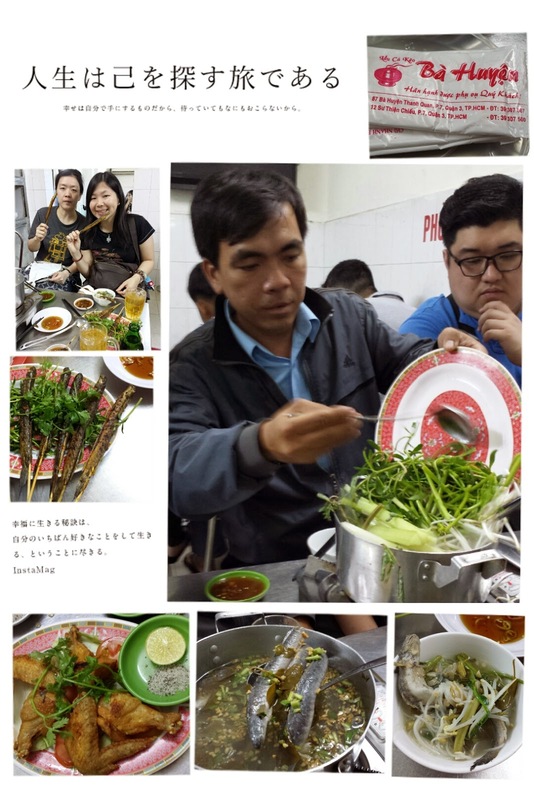 In evening we went to Lẩu cá kèo at 87 Bà Huyện Thanh Quan, Quận 3 to taste the hotpot and grilled Ca Keo or Goby Fish. Read more details story here. After that we had a stroll in the night market. Many things were sold there, mostly souvenirs, t-shirts, branded ‘fake and cheap’ stuffs like the North Face big backpack (bargained as low as VND 270,000 – around US$13), etc. I didn’t take any photo there as I was busy holding my bag tight, afraid to experience any pickpocket in such crowded place. Lol! Thereafter we walked back to the hotel and had a rest again at night. 1. After traveling to other country, I will download the song from or related to the country that I hear during traveling time into my mobile phone, turn it on and on, sing it loud and dance with it (usually inside the toilet) until I get bored and tired of it, then move on to another new song. 2. I can only cook few International dishes such as: Spaghetti Bolognaise, Japanese curry rice, wok fried ee-fu noodles, etc. and not a single local Indonesian dish! 3. I went one big round studying other subjects such as: other languages and hotel management (avoiding those related to accounting or finance as I thought my three elder siblings had enough of it) but at the end I still ended up working in that department, even until now. 4. I prefer spending most of my weekend at home reading book, drinking afternoon tea, watching online movie/drama, sleeping, etc. Gone are the days asking my hubby out for window shopping! Perhaps with more age I have, I prefer to have a quieter and alone time. 5. I love traveling within a small group of people where I lead and plan where to go, what to do, while the rest just follow on my plan! Not because I’m selfish, but because I know what I want! But sometimes it’s good too just to follow what others have planned for me, especially where the place is unreachable on foot and the language is not something that I am familiar with. 6. I had a great and memorable childhood which I spent most of my time playing with my siblings, cousin and neighbors. Playing traditional and detective games, running around, cooking fake dishes using ingredients from soil and trees, climbing out staircase, fence and trees, cycling and being chased by the stray dogs on the street, and so on were the things I miss the most!!! 7. 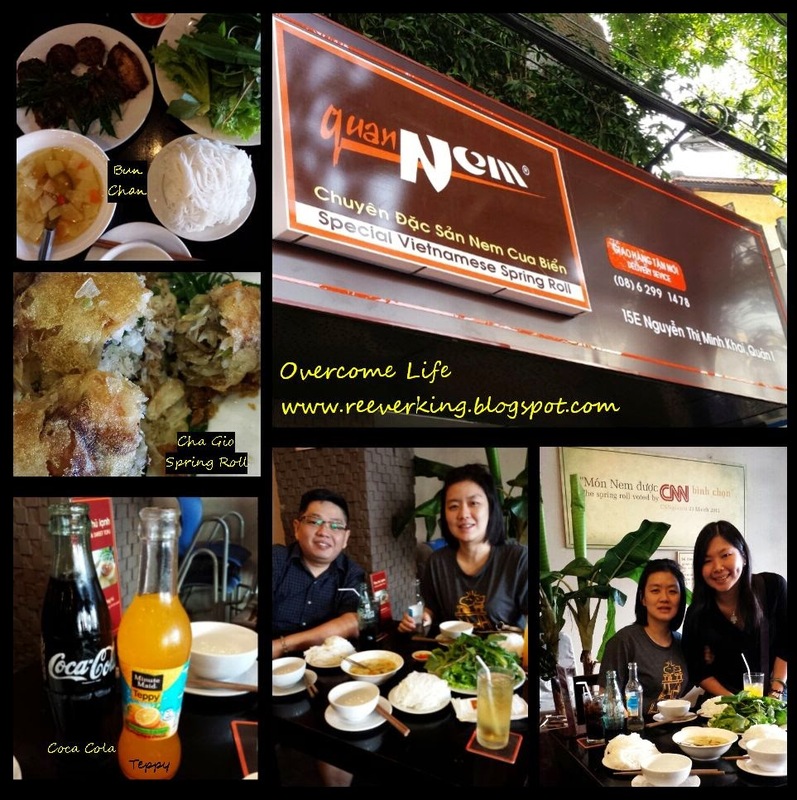 It takes me a life time to learn more about how to overcome the life journey. 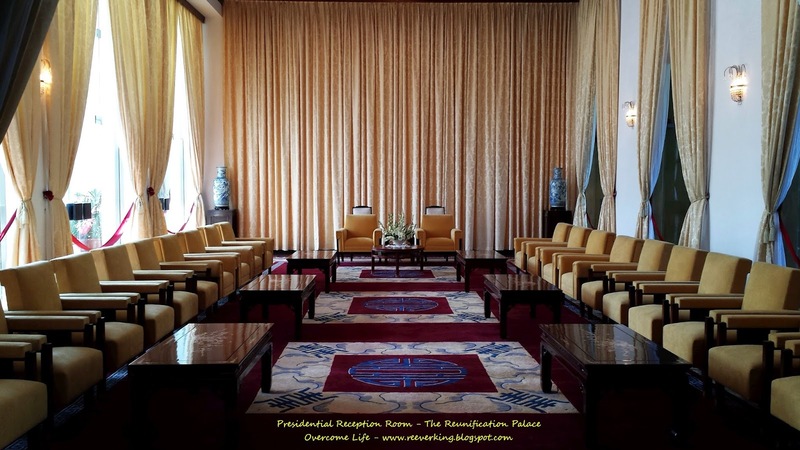 I started it off from the Buddhist teaching and meditation as the basic principles. I learn a lot of real things and happenings from friendship and love relationship. The bad experience made me a stronger person. 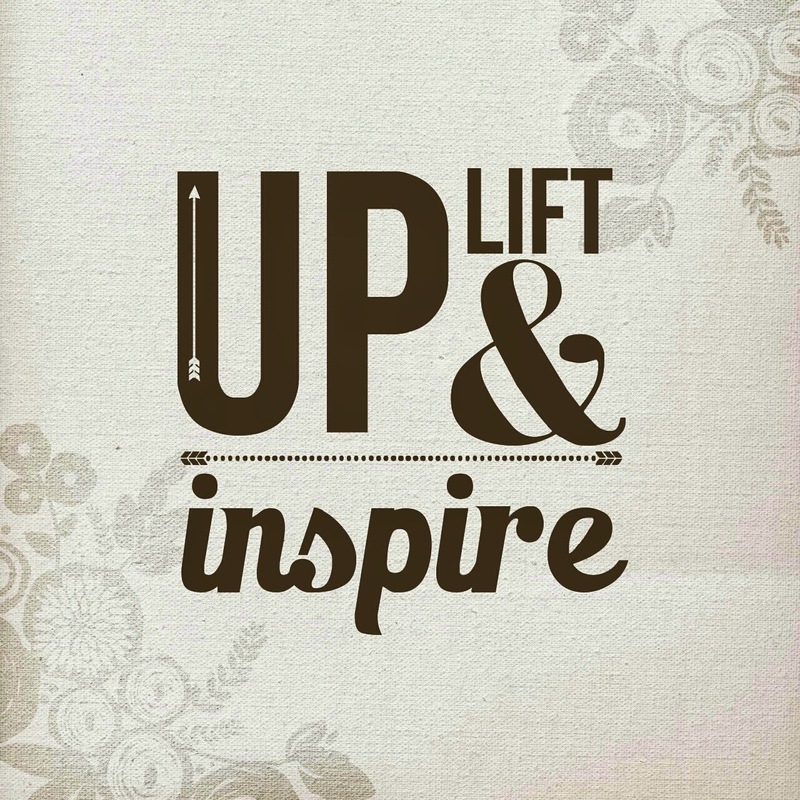 Only few years ago I started realizing the importance of quotes and positive thinking in my life. The self-motivations are mostly coming from within. But loves and supports from outside has tremendously given me a strength to carry on. 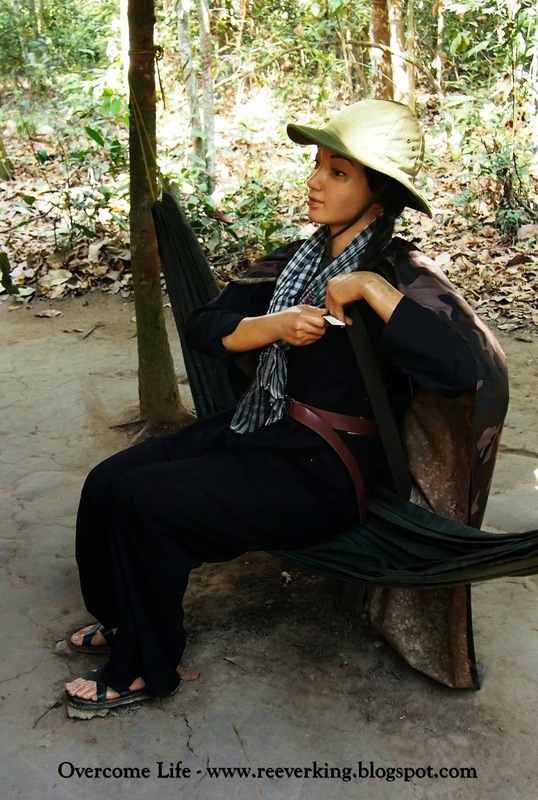 Although I spent most of my living years in South East Asia region, it was my first time visiting Vietnam. 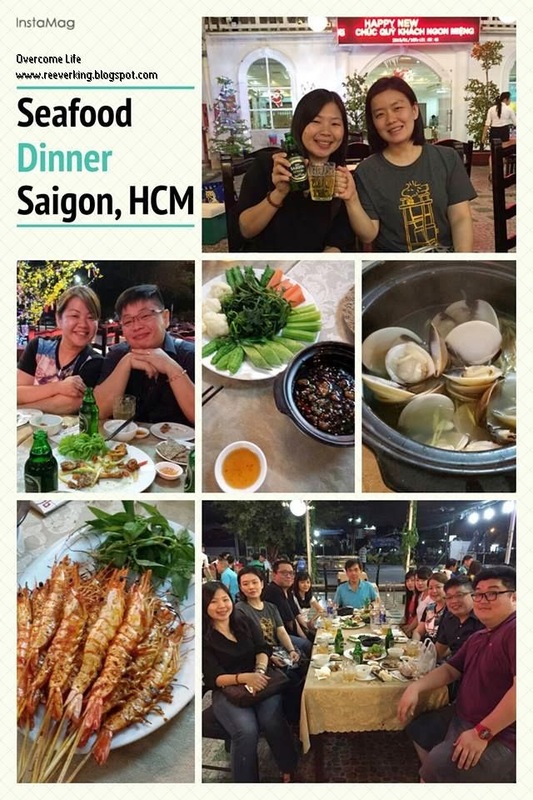 I saw some of my friends posting their photos in Instagram, those taken there in Ho Chi Minh City (previously named Saigon), and the cheap airline ticket promotion by those budget airlines made me wanting to visit it badly. But traveling alone wouldn’t be fun. Therefore, since months ago, I was asking around if there was anyone wanting to go together and if they were free. 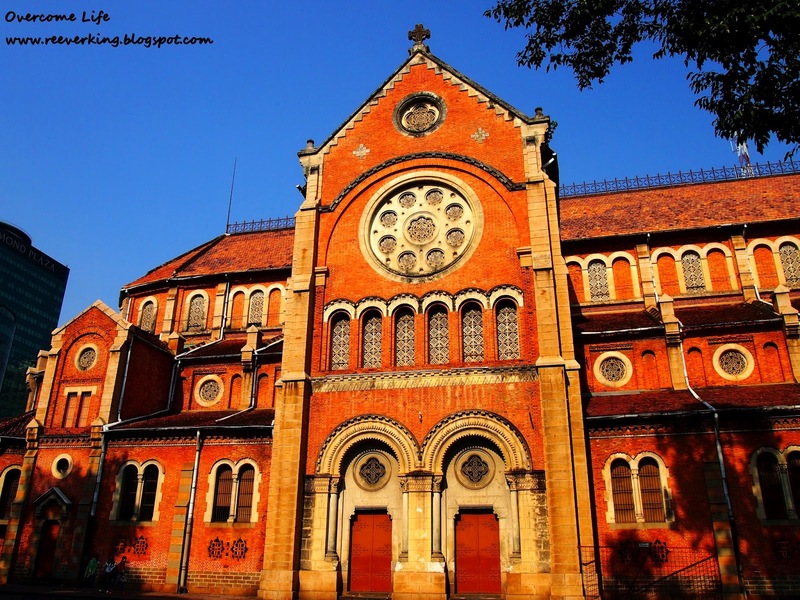 Ho Chi Minh is the largest and busiest city in Vietnam located at the southeastern part of the region. It has more than 9 million people. 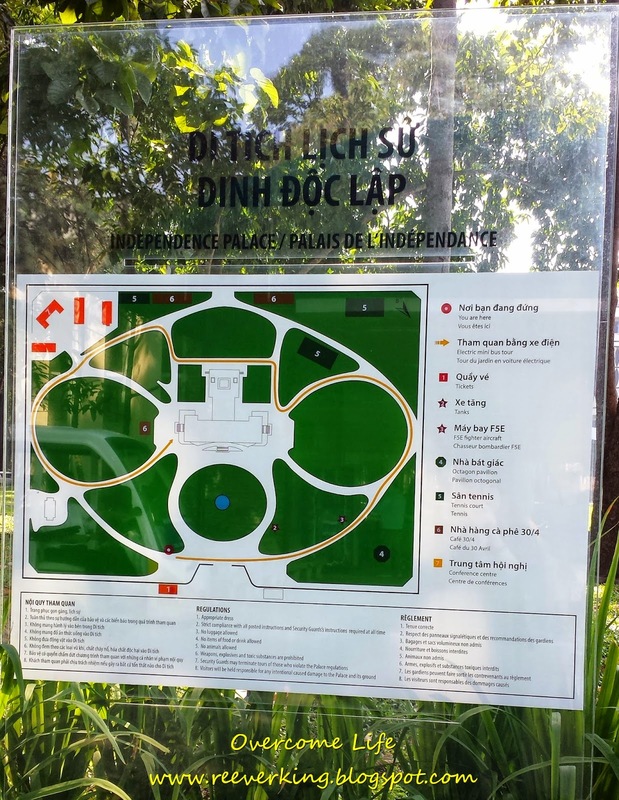 It covers up to Cu Chi District and down to Can Gio, eastern to Long Binh ward, District 9, and west to Binh Chanh District. District 1 is the city’s central district. Many consulates and historical sights are located here. And that is where we stayed most of the time. January is a good month for traveling as the weather is not so hot and most importantly, dry. 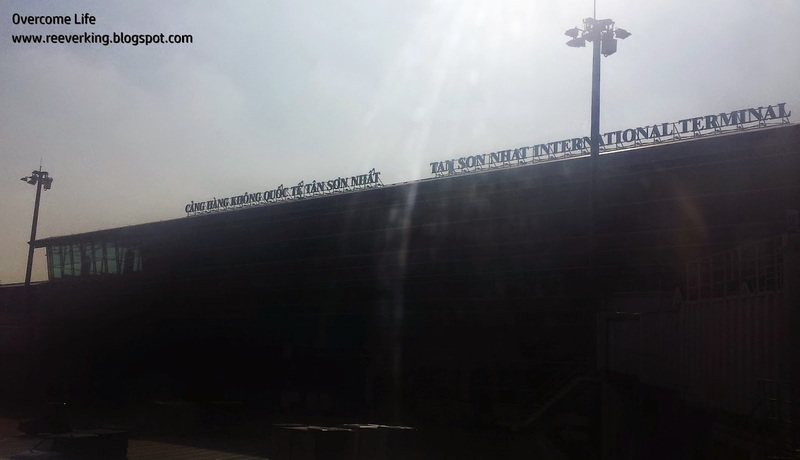 We flew using a morning flight and took us about 1.5 hours from Singapore to Tan Son Nhat International Airport. The airport was opened in 2007, still looked new and bright. We took ‘Vinasun’ cab traveling within the city. It’s the more reliable and recommended cab that used meter all the time. However, some drivers were not so honest bringing us to longer journey although we could actually take the shorter ones. 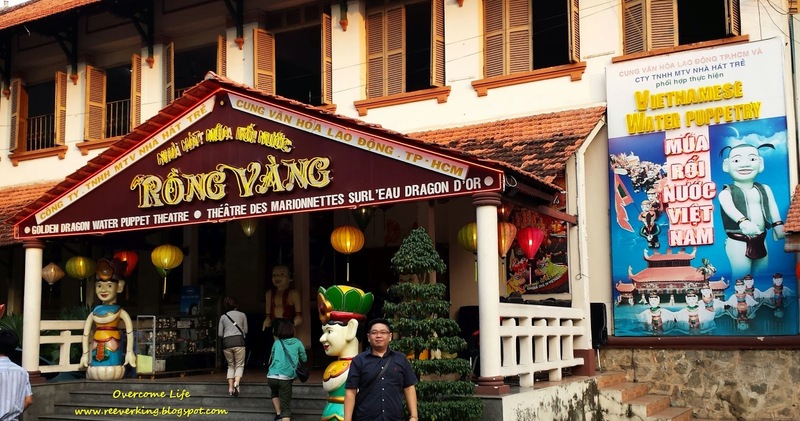 But the fare was rather affordable (short journey cost about 25,000 to 40,000 VND or US$1-2 and longer one – just like from Airport to our hotel in District 1 – was about 150,000 VND or US$7.5). 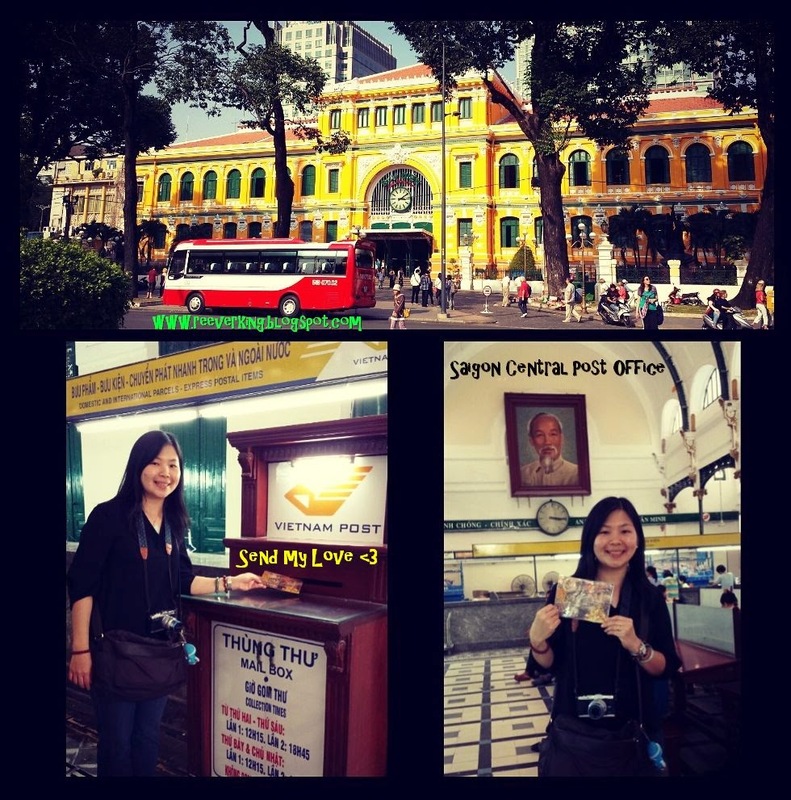 Once we checked in and left our luggage there, we booked some tour from our hotel’s tour representative. It’s kind of tricky that there wasn’t price tag on their tour package list. As first-timer we just took whatever prices that the lady offered to us and only days later we found out that we were overcharged. We finalized the steps as per follow: First, pinch some vermicelli using chop stick into the small bowl. Add some vegetable – since there are so many varieties of vegetables, just added whatever you like. Add the piece of pork meat and pour some sauce with pickles onto it. Voila!!! Ready to eat!!! 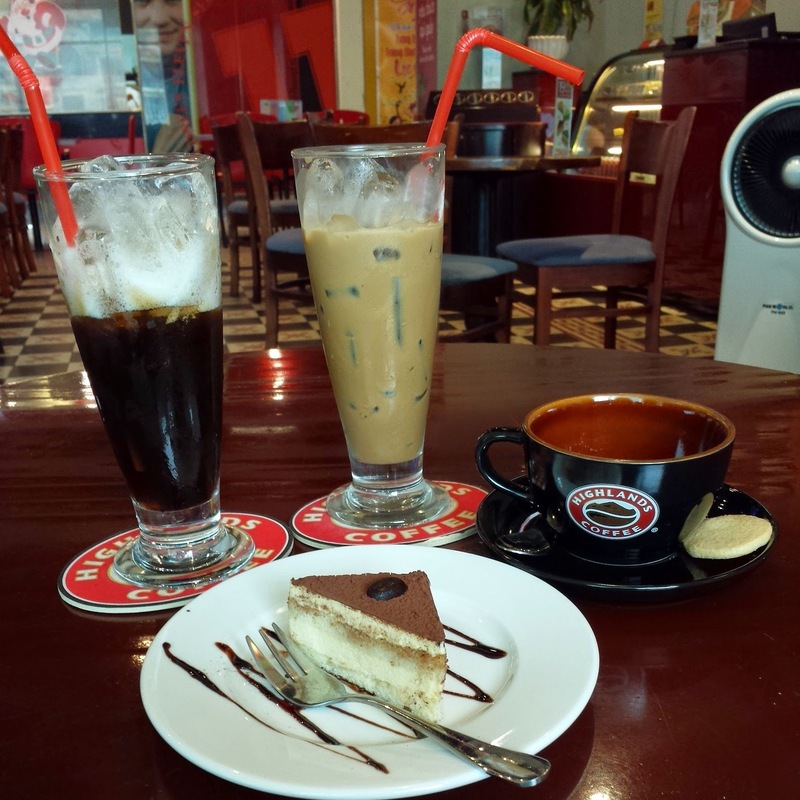 So, while waiting for it to be opened, I remembered that there was a nice recommended Café nearby the area. 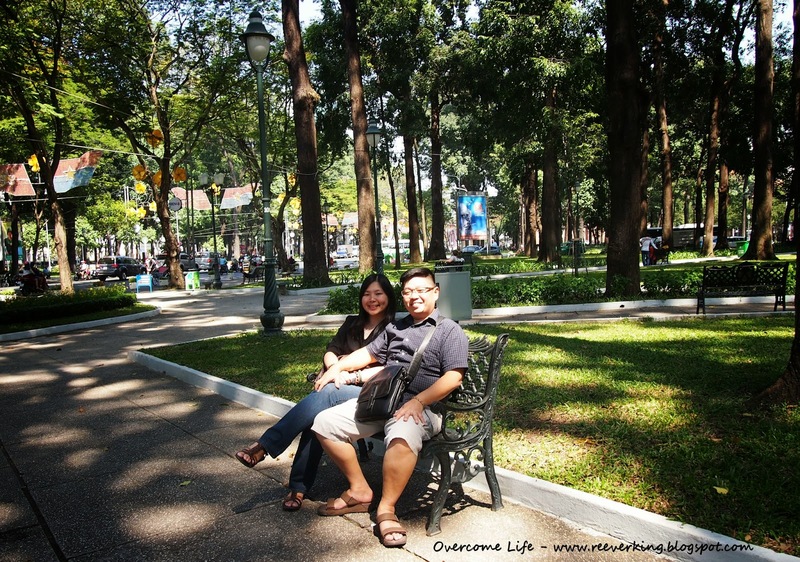 We walked there, located just beside the park in front of the Reunification Palace and very close to Notre Dame Basilica Cathedral. We ordered a plate of Banana flambé crepe too as a dessert. Although I expected there would be flame on my banana crepe (like what we did during school time serving our guest in front of us), unfortunately there wasn’t any. 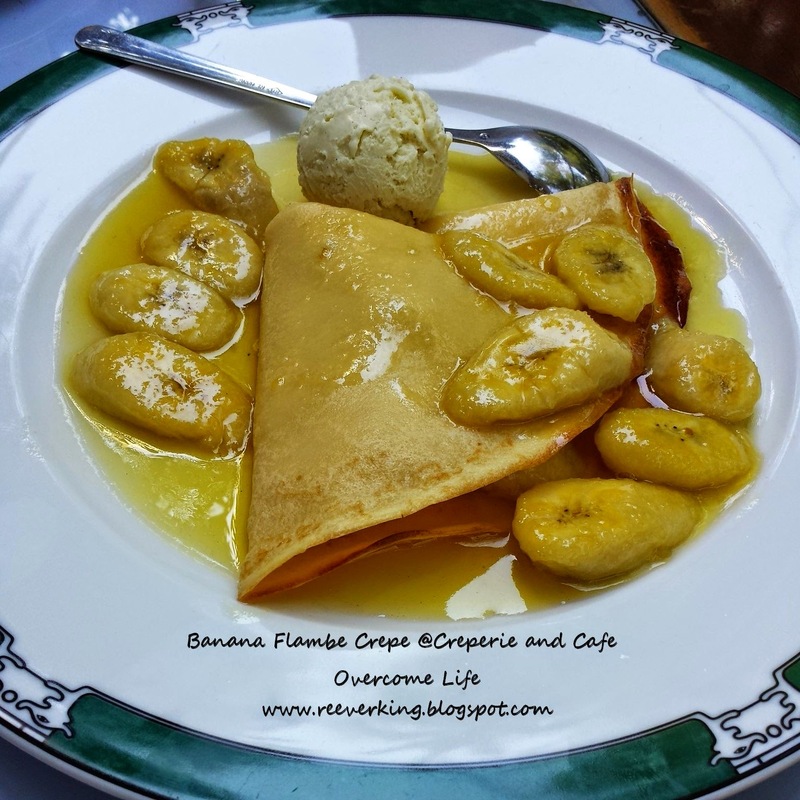 It’s just a normal crepes served with banana, syrup, and ice cream. 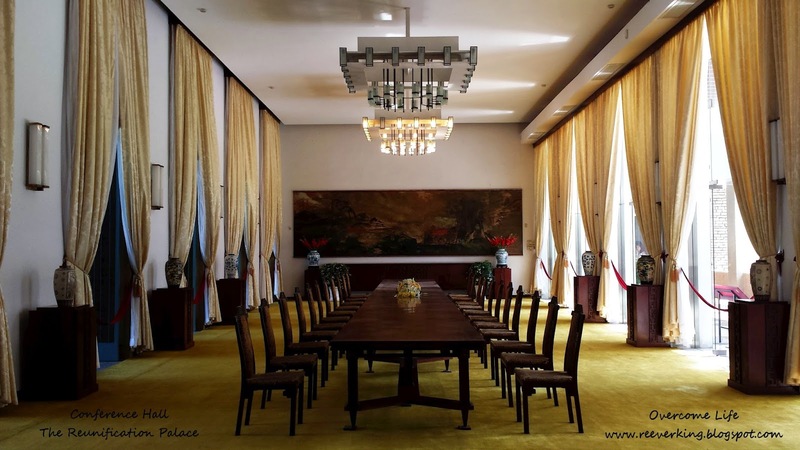 So, we ate, drink, and ate, and enjoyed until the Reunification Palace was opened. 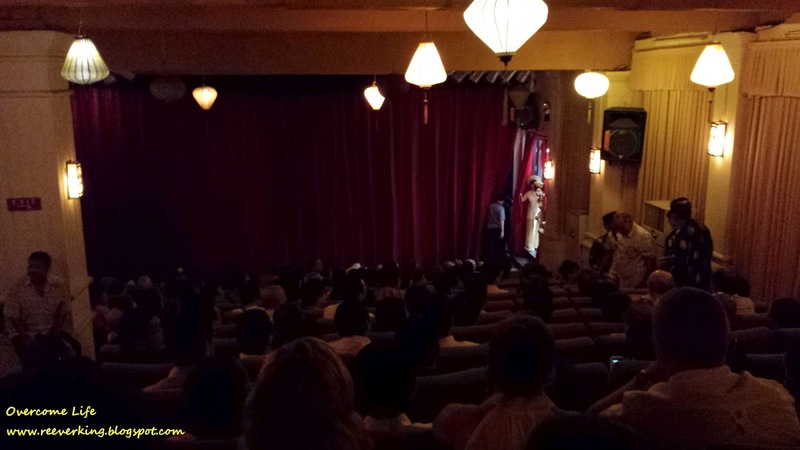 The ticket cost us 30,000 VND per person. We browsed around the area ourselves. You can read more about it here. 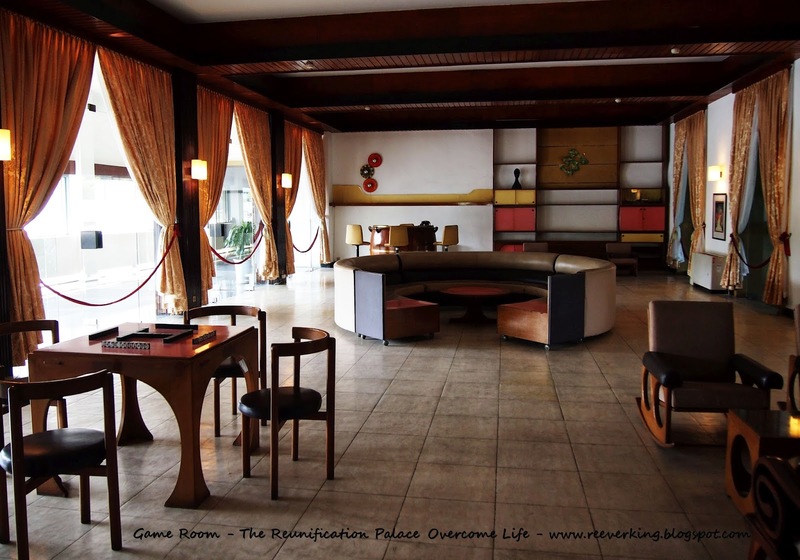 The decorations, furniture, designs shown really reminisced us into the past. What used to be luxury things almost fifty years ago looked very outdated in modern world. However, it was still a great collections and worth to visit. 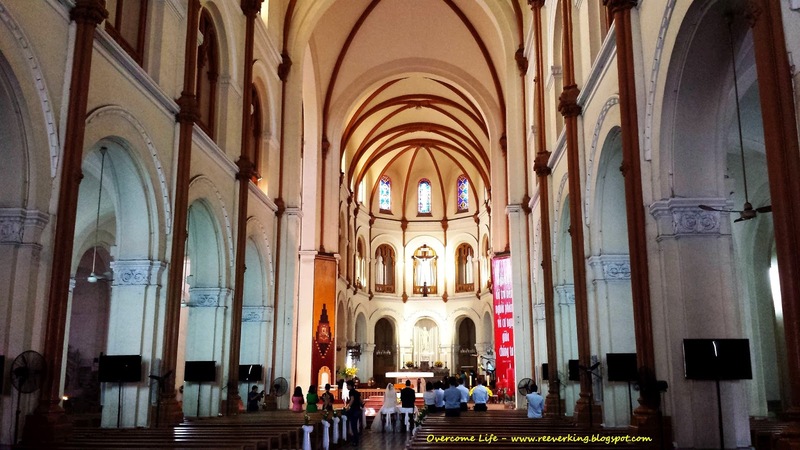 From there, we walked to Saigon Notre-Dame Cathedral, a famous and historical church constructed between 1877 and 1883 by French. There were visiting hours from Monday to Saturday: from 8am to 10.30am and from 3pm to 4pm. Therefore, we were very lucky when reaching the church at 3pm (we weren’t aware about the opening hour before visiting). 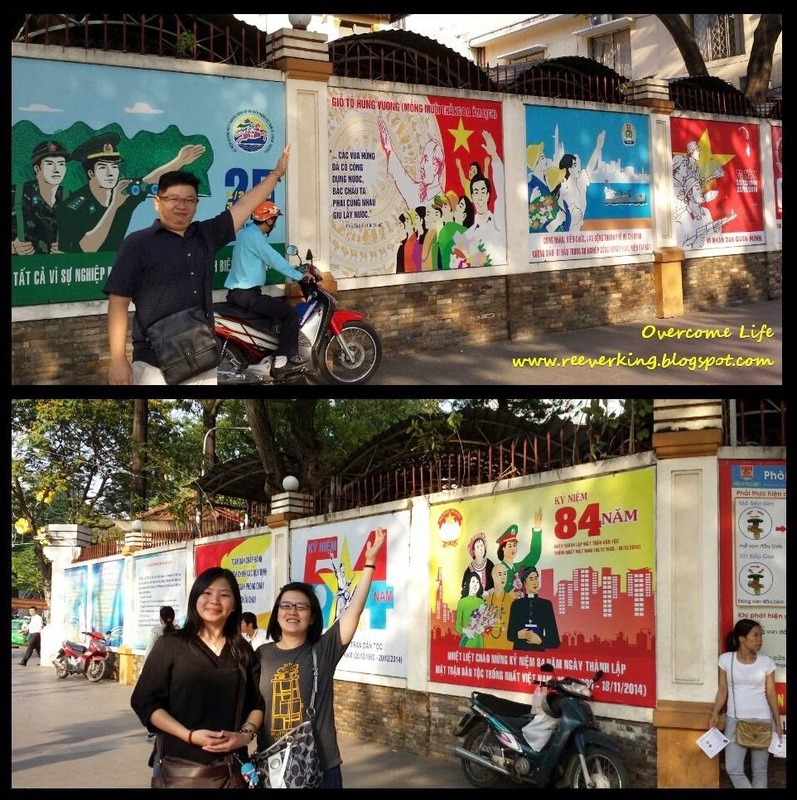 At 5pm we headed to Golden Dragon Theater at 55B Nguyen Thi Minh Khai St., Dist. 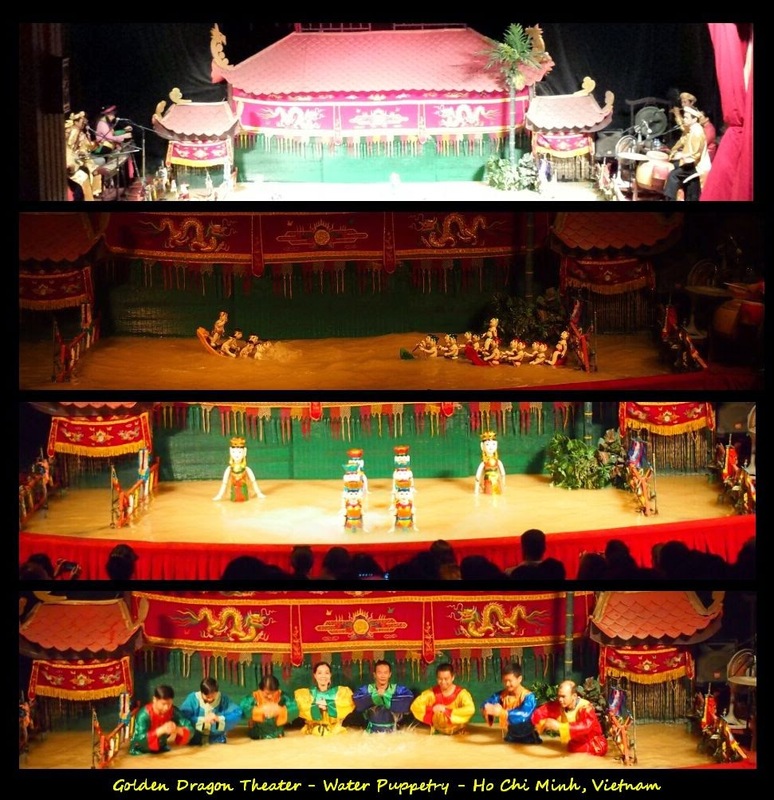 1 to watch the Vietnamese cultural heritage art show, Water Puppetry. They have two shows per day: 5pm and 6.30pm. 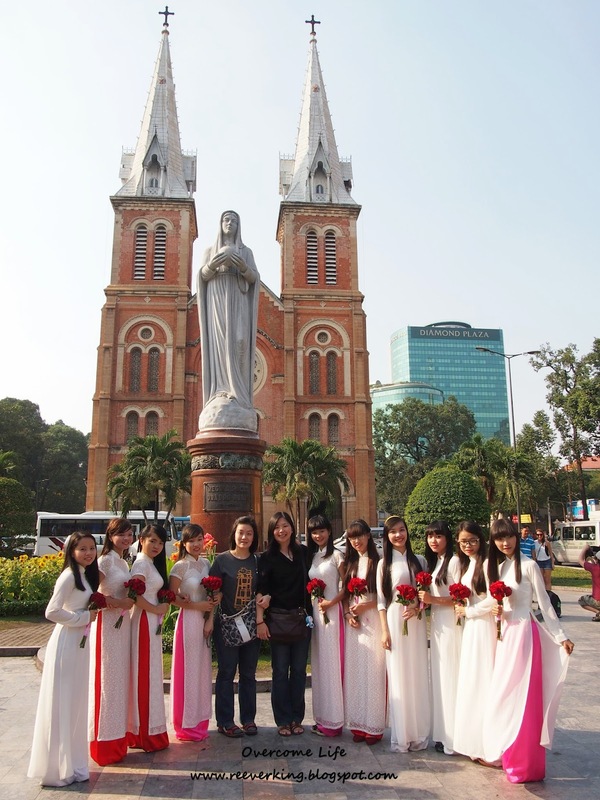 We were overcharged by the tour agent paying VND 160,000 per pax while my sister-in-law bought it only at VND 90,000. The theater was not big and very old. Somehow I felt a bit eerie but tried hard to ignore. We were seated at the most back row and only three of us sitting there. Despite those feelings, we felt grateful by being able to watch it ourselves there (not only in front of TV). In fact, we felt amazed by it! The colorful lightings, the live singing, sounding, and music played by multi-task players at both side of the water, the various puppets shown during the 50-minutes show and played by very talented artists behind the curtains, the money we paid for was so much worth it! Only too bad all the conversation and song was in Vietnamese language and we had no clue on what they were talking about. If there was a display of the translated words in English or Chinese (like what other theater/establishment do), it would be very much better! My bestie, Celipu, lent me this book almost two months ago and I managed reading it this month only. It’s an Indonesian story book written by a Balinese man, Teddy W. Kusuma (his role as Twosocks in this book) and a Chinese Indonesian from Jakarta, Maesy Ang (her role as Gypsytoes). 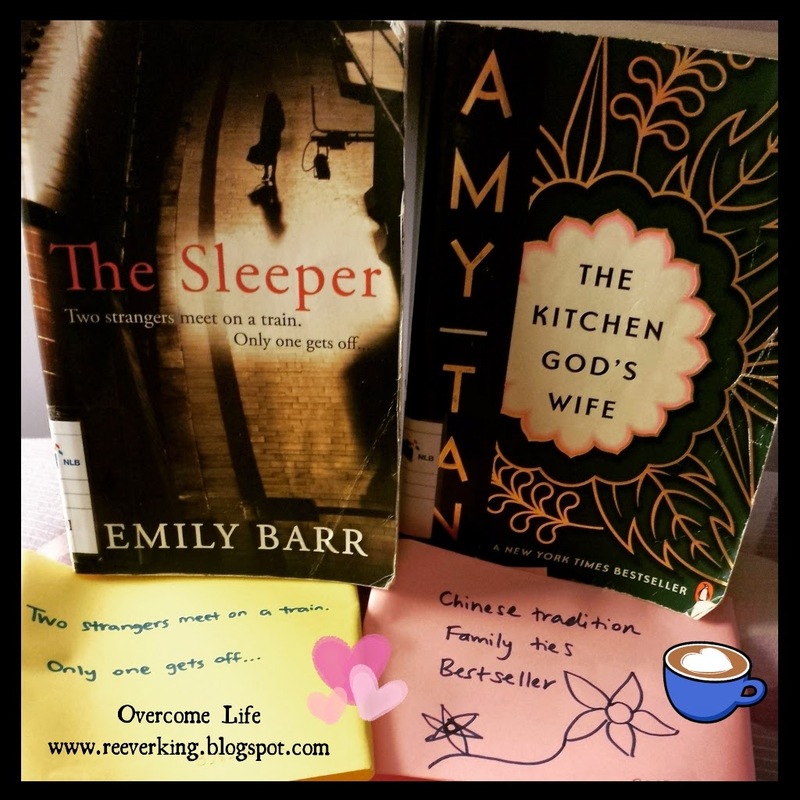 Find out more about the two authors here. 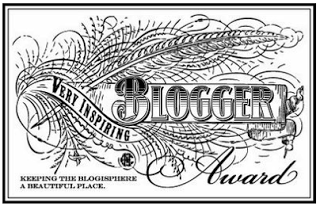 They wrote a blog too (in bilingual languages: English and Indonesian language) that depicted their activities in their lives. Just like any other writers, they both like to write and read, also traveling! That’s what the book was about! Both of them took turn in writing their traveling stories. 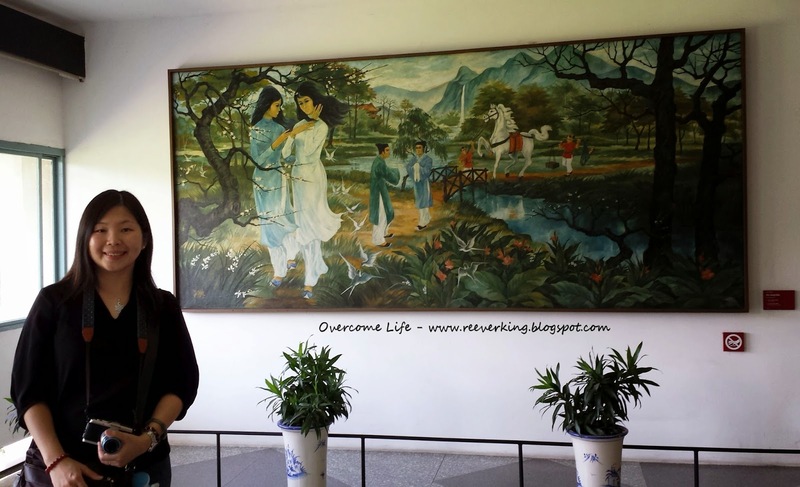 Gypsytoes wrote about her traveling journey when she was studying in Amsterdam while Twosocks wrote his stories when he traveled around Indonesia, and once they met up in Bangalore in India, when Gypsytoes had to travel there to do some research for her thesis. 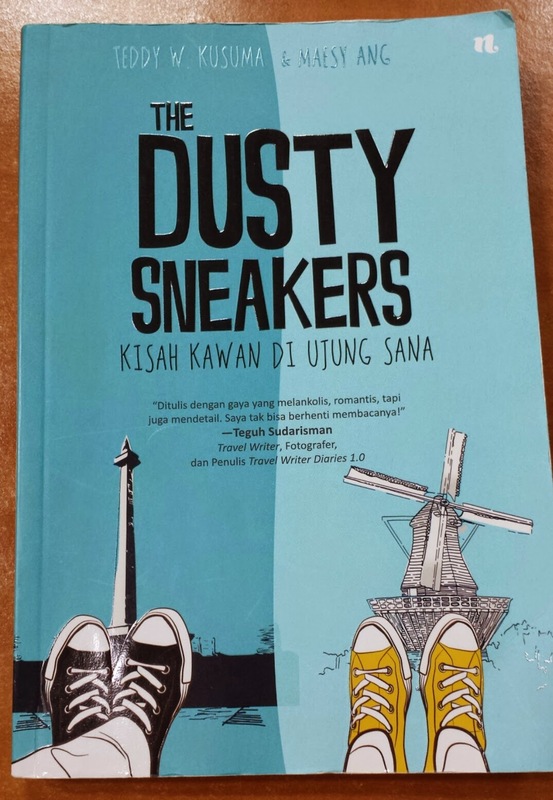 Other than traveling stories, they also wrote about their hometown in Indonesia. As said above, they both came from different places: Twosocks was from Singaraja, Bali, while Gypsytoes was from North Jakarta. 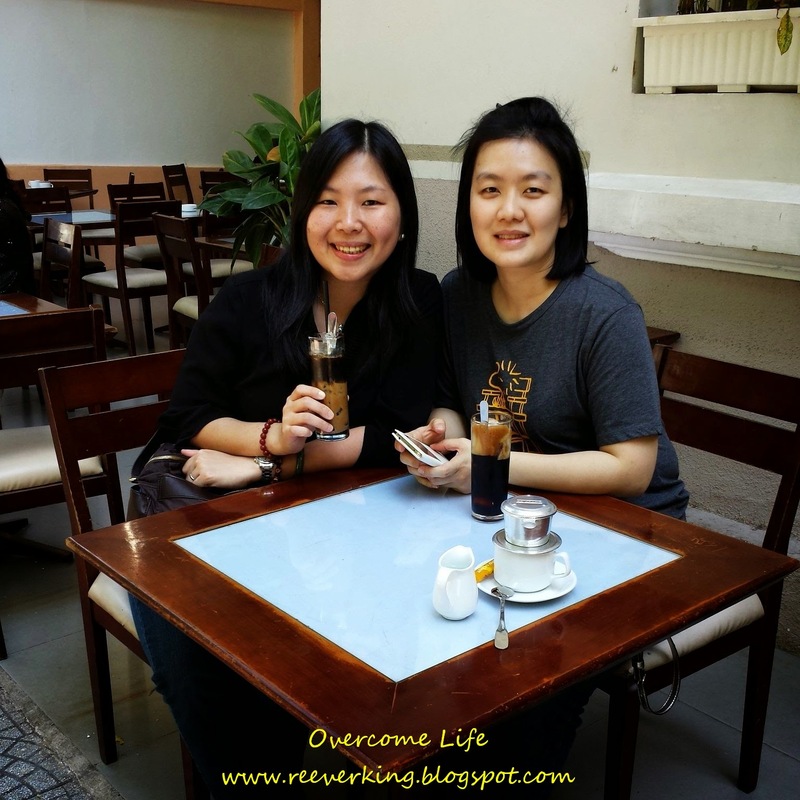 Different background, but they both shared the same passion: drinking tea, talking about book, traveling, etc. 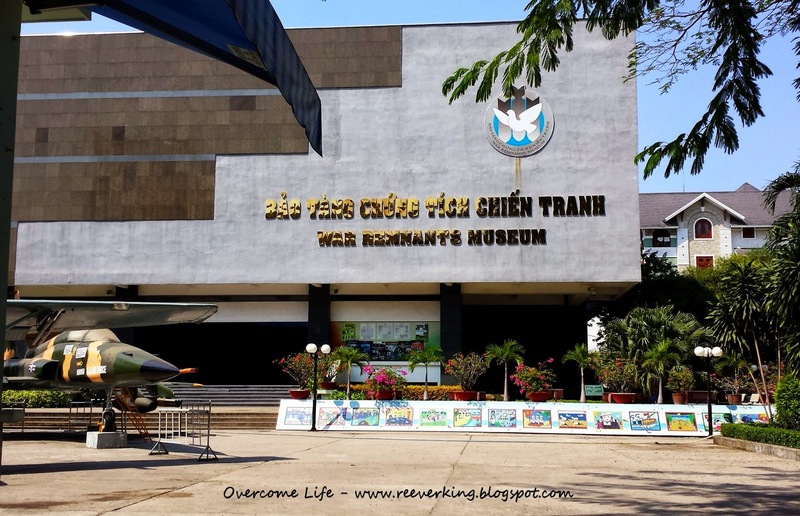 It’s the only destination that I thought I must visit during my stay in Ho Chi Minh. 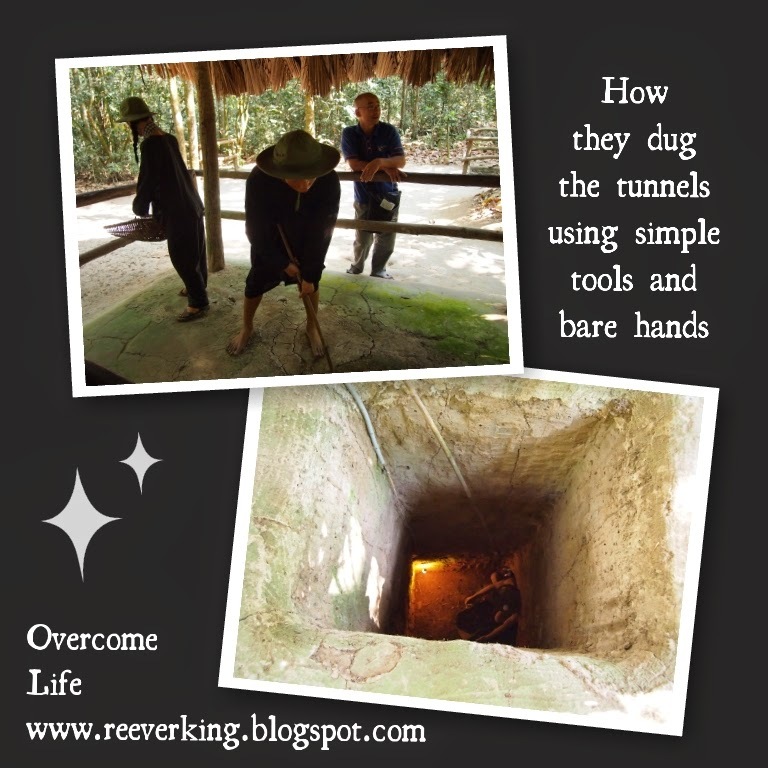 I heard about it before and often saw the photos where people’s head coming out from a small underground hole. I was wondering how small the hole inside the tunnels look like, whether I could fit into it, or whether I dared enough to go through it, etc. We booked a tour through travel agent from our hotel once we arrived. 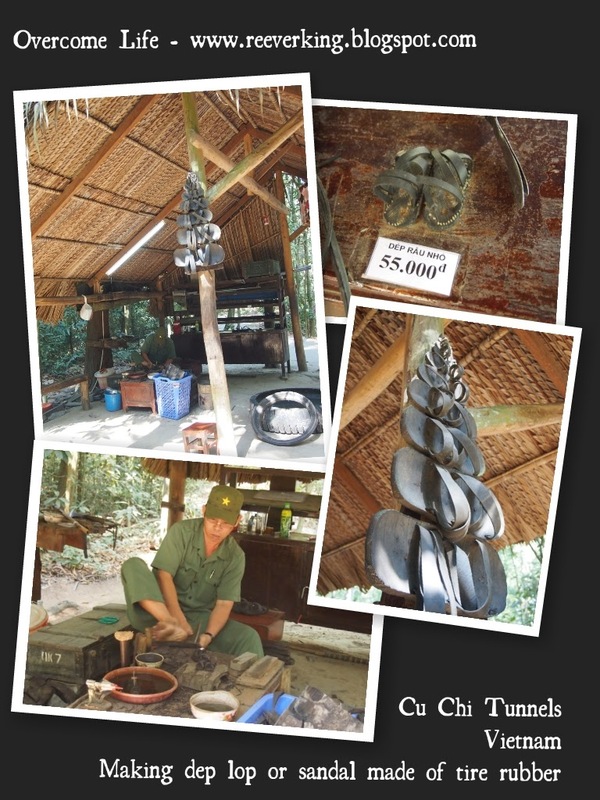 We found out few days later that it cost us a bomb at rate of US$40/pax for Classic Cu Chi Tunnels half-day tour, while others could offer us as cheap as US$10/pax. We departed the next day at 8am from our hotel together with 4 other participants. The journey took us about one and a half hours. 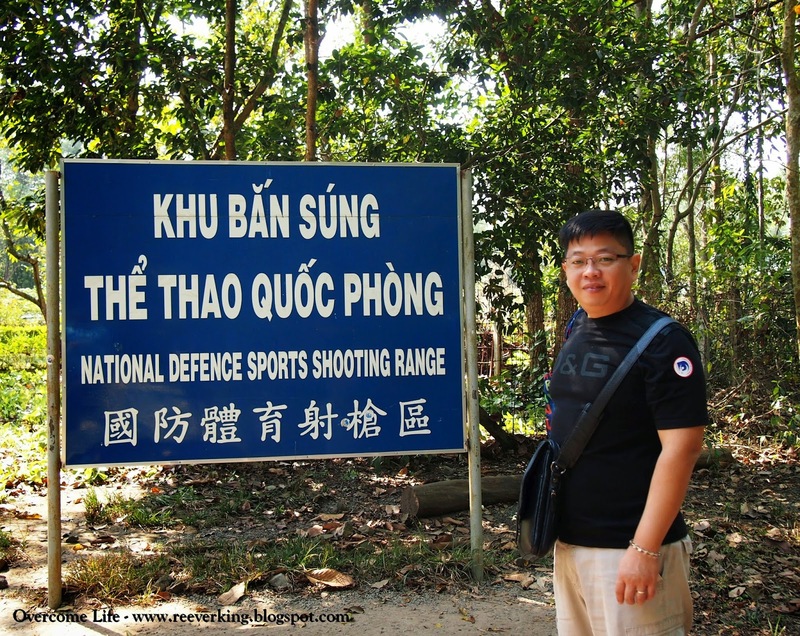 There were two different sites to experience the tunnels: Ben Duoc – contains part of the original tunnel system, usually visited by Vietnamese, and Ben Dinh – the tunnel had been modified to cater the foreigner’s size and mostly visited by International tourists. Eventually we were brought to Ben Dinh site. Along our way there our tour guide explained to us what the tunnels are about together with the history of the war where the Viet Cong fought in the war using their Guerilla tactics, etc. 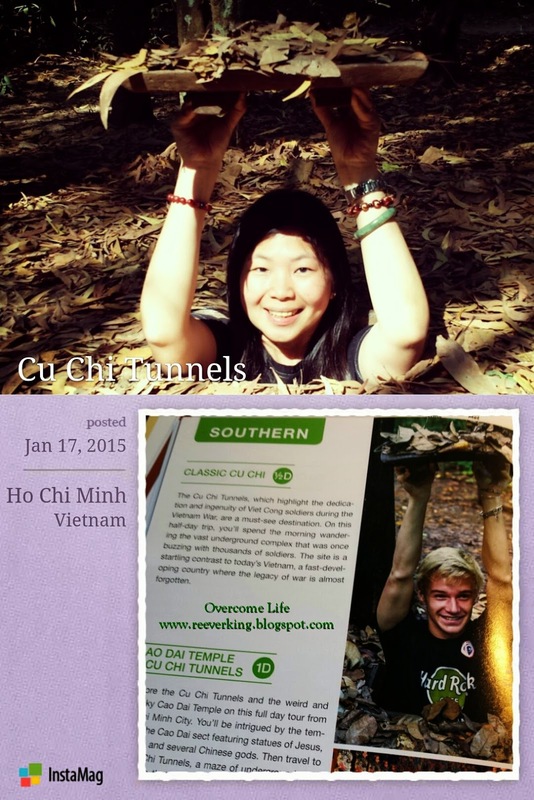 The Cu Chi tunnels were the location of the Vietnam War and the Viet Cong’s base back in 1968. It was about 120km long and as deep as 12 meter underground. The original size was about 60cm width and 80cm height. However, they’ve resized it into 80cm width and 150cm height so that it’s accessible for Western tourist to experience it. 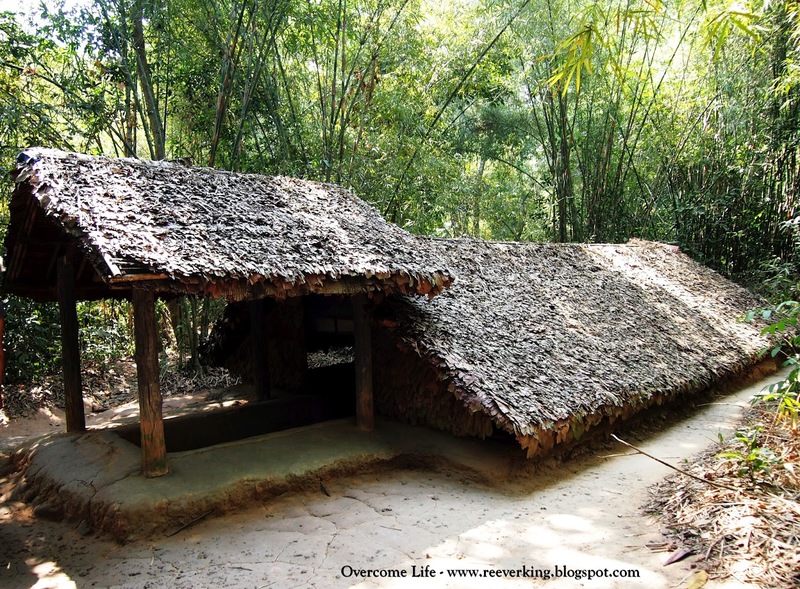 They used it as hiding spots, as well as communication and supply routes, hospitals, food and weapon storage, and living quarters for numerous North Vietnamese fighters to resist from their enemies. Once we entered into the location, we were brought to a place to sit and watch the black and white propaganda movie. After that we went through a long way road showing many things such as: various tunnels entrance, different types of booby traps with Punji sticks – bamboo and metal spikes (they all looked so scary as their purposes were not to kill the person, but to make the person who was injured to suffer slowly from the metal spikes that pierced through their body parts), a destroyed American tank, mannequin showing the Viet Cong’s uniforms (how they dressed like), etc. After those exhibits, we finally reached to the tunnels site. 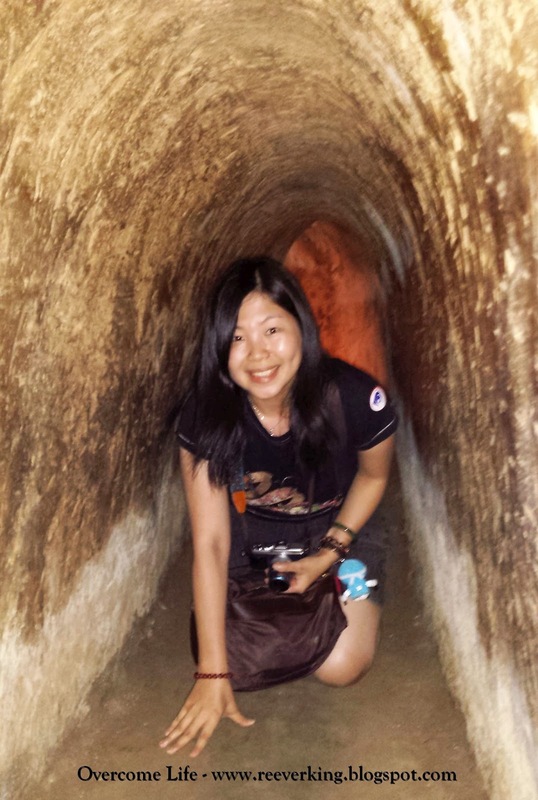 The tunnels were not for the claustrophobic as it was dark, small, and stuffy. According to our guide, the tunnels that we tried were 100m length and divided into 5 exit holes (1 hole for every 20m). So, if you thought that you had enough or couldn’t accept it anymore, you could anytime go out from your nearest exit hole. Three of us tried entering into the tunnels. However, we didn’t finish it into the last exit as the tunnel got tighter and smaller after the 3rd exit. 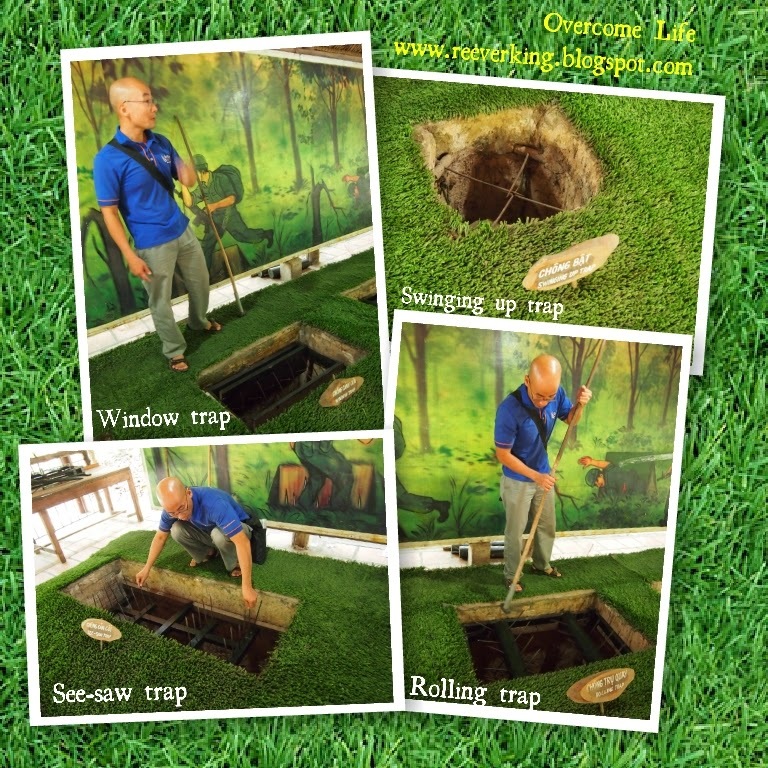 We had to bend down and crawl too as the hole got smaller (not suitable too for those who had a back pain). I had to turn on my phone’s torch light at all times as it was really dark! My friend was almost losing her breath after bending down and crawling through it, and I decided to get out at the 3rd exit door. Wearing the long pants would be recommended as well! 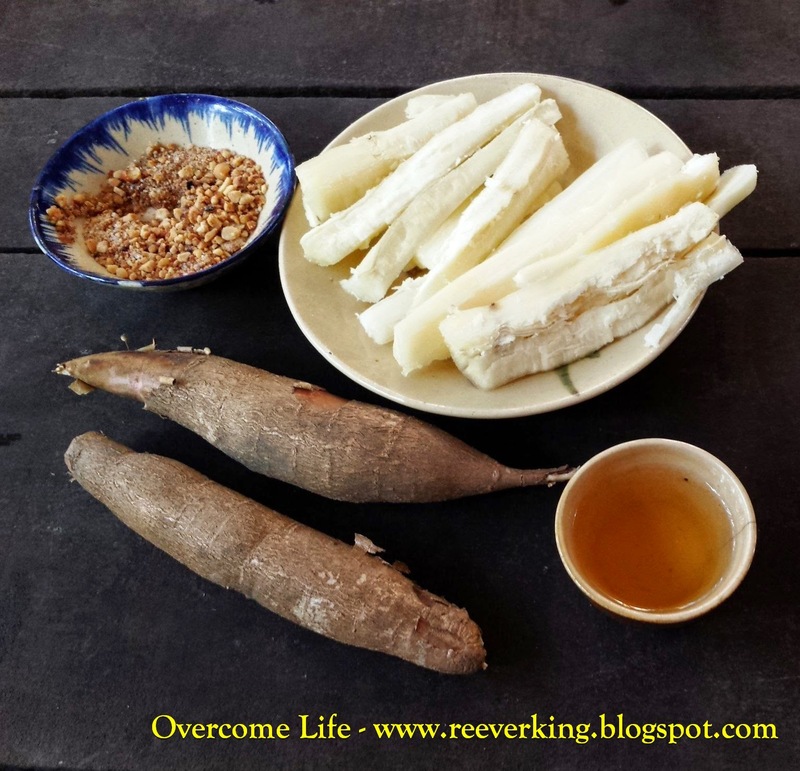 Once done, we would proceed to place where we could sit, drink a cup of tea, and taste the steamed tapioca dipped into the mixed of grated peanut, sugar and salt. It was the food that usually easily available during war times. 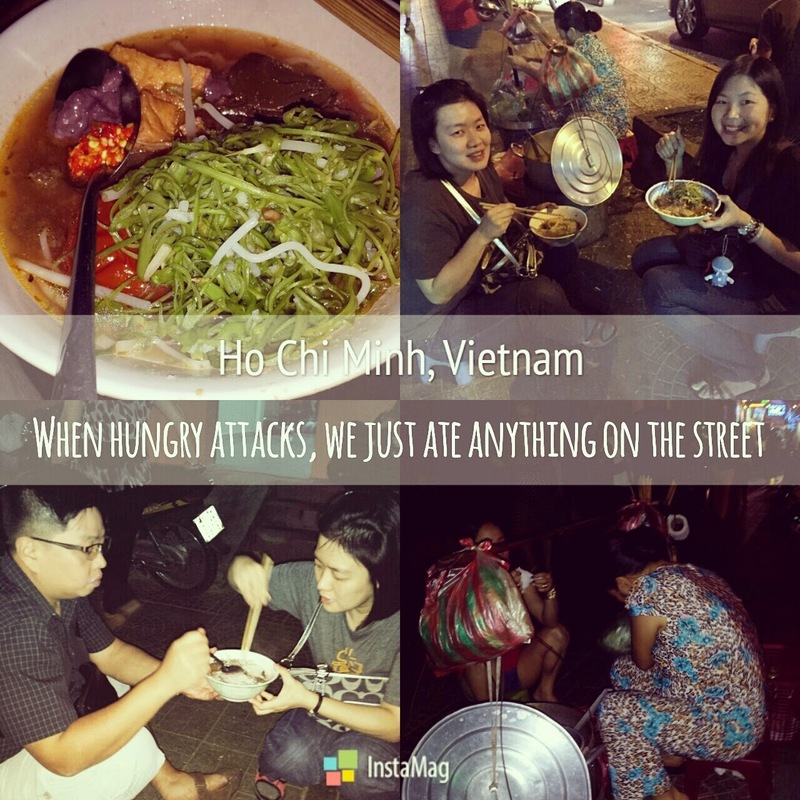 It’s such a great experience and a MUST VISIT place if you are visiting Ho Chi Minh! Try to find the cheaper tour that provides you with the same thing (transport, guide, and entrance). I heard that the entrance ticket cost less than US$5/pax. 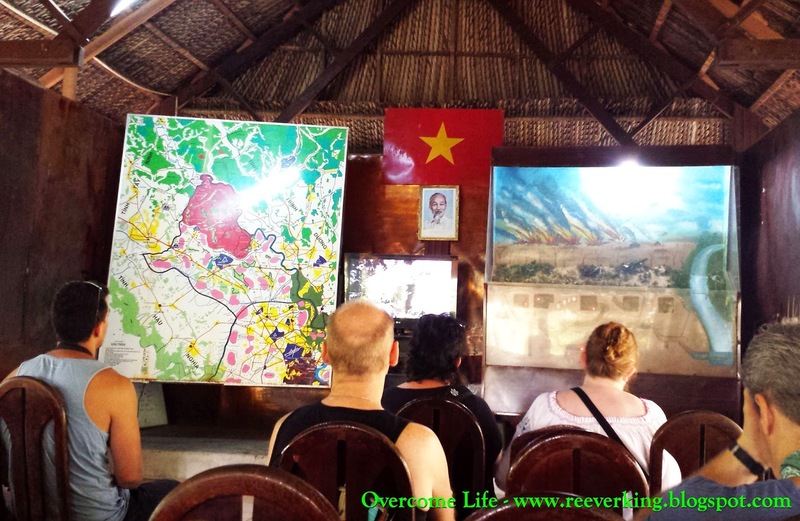 Personally, I feel very happy being able to visit this place and learning some history from the Vietnam War and what’s going on around the country from our tour guide. Because all through my life, I’ve only learned about Indonesian history, that’s it. And local people are the best person to tell us their country’s condition, aren’t they?